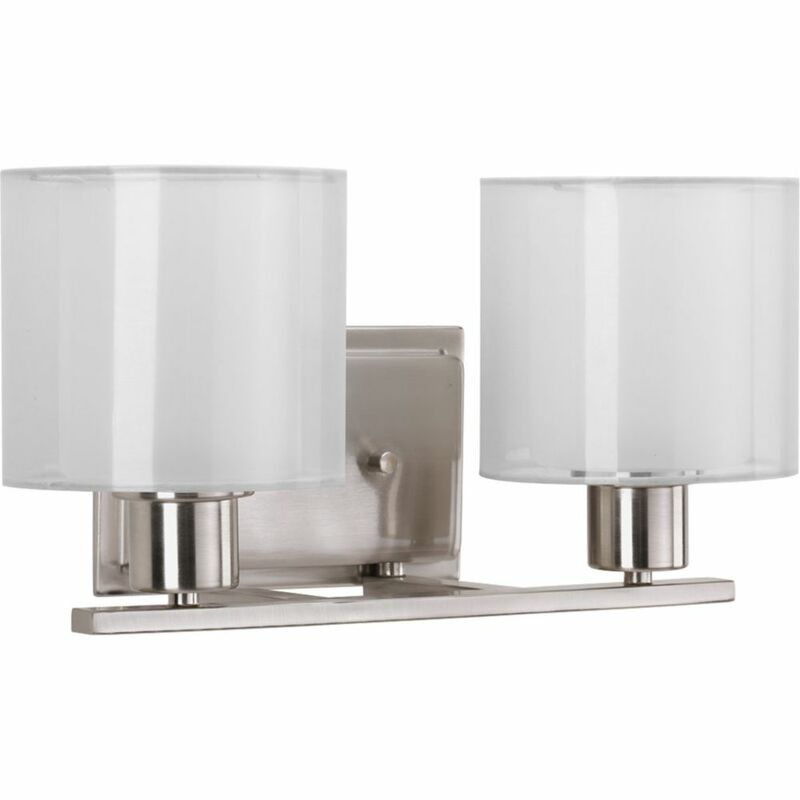 This Hampton Bay fluorescent bathroom light fixture features a durable brushed nickel finish and a slim, modern design that compliments any décor. A white diffuser spreads soft light evenly throughout the room with a warm glow. This energy-efficient fixture features a white acrylic diffuser supported by a sleek metal frame. This design offers great versatility with installation options that include horizontal or vertical mounting. Great for use in bathroom over or beside a mirror. Invite Collection 2-Light Brushed Nickel Bath Light Invite provides a welcoming silhouette with a unique shade comprised of an inner glass globe encircled by a translucent sheer Mylar shade. The rich, layering effect creates a dreamy look that is both elegant and modern. Offered as a complete collection, the Invite styling can be carried throughout your home or as a focal style in a special room. Invite Collection 2-Light Brushed Nickel Bath Light is rated 5.0 out of 5 by 1. Rated 5 out of 5 by CBJ from Really Pretty Really pretty light. Excellent buy. Used this in a powder room. I didn't install it so I cannot comment on the installation. It's difficult to tell from the photo but there's a white glass on the inside and it's covered by a screen like circle over that white glass. It's much prettier in person.